Elsa Bunny Snap Juice info about the game-Games2Rule. Today Elsa invites us to learn how to make Bunny Snap Juice Recipe.Bunny Snap Juice Recipe is a very easy and tasty juice.It makes a great combo with apple,carrot and ginger..! 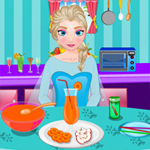 !Just follow the cooking instructions that Elsa gives you step by step and make sure you will stick with the recipe and you will see how to mix the ingredients and prepare these Bunny Snap Juice Recipe.Have fun!